We are excited to announce that our Elementary School program will return to Wednesday after school (2:30-3:30), but we are still in great need to find subs and would SO LOVE finding an upbeat and fun musician for our program! This could be a high-schooler, college student, or available adult. It is a MUST to get registration forms in before our first day (Sept.6) so that we know your child is permitted to walk over from the school. Find the Registration information along with a message from our Director of Religious Education, Michelle Smith-Puckett, at the Parish School of Religion Page. Forms can also be found at the back of either church or the church Hall. There will be a mandatory parent meeting for grades 6-12 on Wed, Aug 30 following 6:30 mass at St. Michael parish hall. 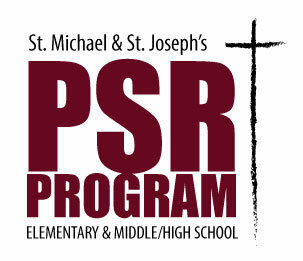 The first session of PSR for middle and high school students will be Sept. 6, beginning at 6:30 pm. Find the Registration form at the Parish School of Religion Page or at the back of either church or the church hall.